We are very excited to announce the South Pole Telescope's first major scientific results: detection of four galaxy clusters, three of which are new discoveries! We've been working hard over the last couple of months to analyze the data from the 2007 and 2008 observing seasons, and these first results are just the tip of the iceberg. On October 10th, we submitted a paper documenting the new discoveries to the Astrophysical Journal. The paper is available online here. If you have been following our blog, you may remember that the SPT is a telescope sensitive to radiation (light) in the microwave region of the electromagnetic spectrum. The telescope is designed to detect the Cosmic Microwave Background Radiation, which is light "left over" from the Big Bang. With telescopes like the SPT, we can map out the microwave sky and study this fascinating record of the early universe. One of the key scientific goals of South Pole Telescope is to search for places where the Cosmic Microwave Background (CMB) light has been distorted by large collections of matter and galaxies called galaxy clusters. When the CMB light passes through a galaxy cluster, its spectrum is changed through something called the Sunyaev-Zel'dovich effect. By searching for the spots in the sky where the CMB is distorted in this way, we can find galaxy clusters and study their properties. If we are able to discover many galaxy clusters, we may be able to use them to learn more about the history of the expansion of the universe, and how it has been affected by the phenomenon known as Dark Energy. That was a pretty quick review, but if you want some more background details, take a look at our webpage. 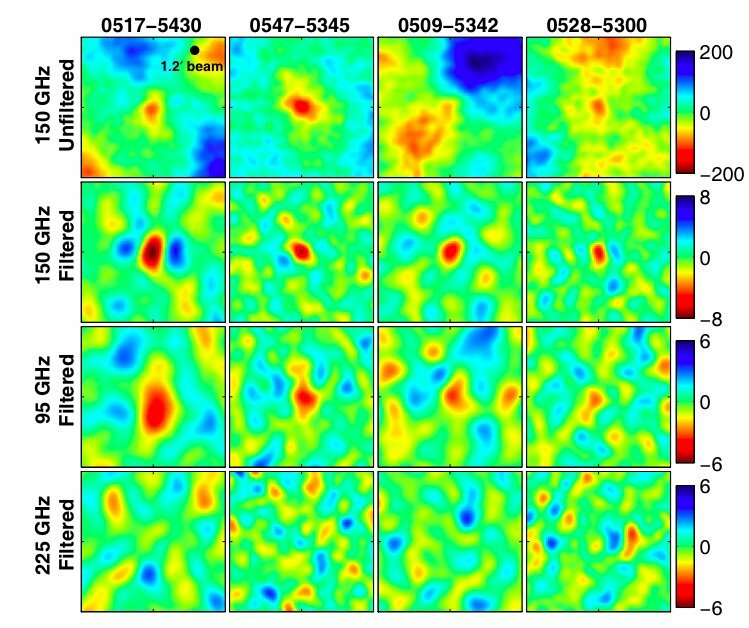 It takes a lot of work to sort through the raw data from the SPT and make maps of the microwave sky. It then takes even more work to search those maps for clusters! We have only just started the whole data analysis process, but we were excited to immediately see four strong cluster signals in some of the maps that we made from our 2007 and 2008 data. We have detectors that are sensitive to three different wavelengths or frequencies of CMB light (basically three different colors). In the maps made from data taken with our 90GHz and 150GHz detectors, the cluster signature should look like a dark blob. We don't expect to see any sign of the cluster in the data taken with our 220GHz detectors. Having three different "colors" in this way gives us a couple of cross-checks to make sure that what we are seeing truly are clusters and not just features in the CMB itself (or some sort of noise). Below is the main figure from our recent paper. The top row shows images of the four clusters. The color scale shows the intensity of radiation detected at 150GHz, and the dark blobs in the center are the four clusters. 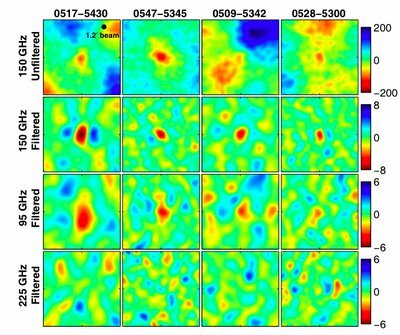 It's possible to filter the maps in order to pick out the cluster signal and ignore more of the background CMB patterns, and the rest of the rows of the figure show these filtered images. The clusters show up in 150GHz and 90GHz, but not at 220GHz, just as expected. The really exciting thing is that three of them are brand new discoveries - only the first one was previously seen by other telescopes. We're celebrating our first results, but not slowing down! We have a lot of data that we haven't analyzed yet, and there are many more clusters hiding in it waiting to be discovered! While those of us in the Northern Hemisphere have been hard at work analyzing data and preparing for the next summer season at pole, our tireless winterovers Keith Vanderlinde and Dana Hrubes have been keeping the telescope up and running and performing all of the observations. The sun finally rose at the South Pole not too long ago, and the very first airplane of the season is due to arrive at the pole sometime in the next 24 hours. It will bear, among other things, the first fresh fruits and vegetables that Keith and Dana have been able to eat for 8 months! They've done an amazing job and we all owe so much to their efforts. Hopefully they are both looking forward to vacations in warm locales in a few weeks. 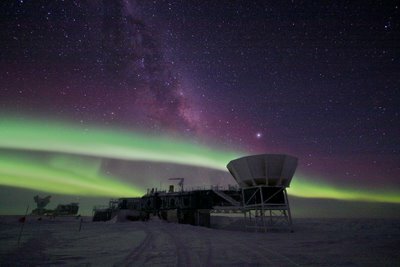 One of the perks of enduring the dark cold winters at the South Pole is being able to experience the spectacular winter skies. Among the photographs that Keith has sent back, the one below has to be one of the most striking. It's almost enough to make you want to winterover!